MILFORD, Mass.--(BUSINESS WIRE)--Waters Corporation (NYSE:WAT) introduced the RenataDX™ Screening System, a flow-injection tandem mass spectrometry (FIA-MS/MS) system for rapid high-throughput analysis of extracted dried blood spots and other human biological matrices. “Waters has long been a trusted specialty measurement partner for mass spectrometry in the clinical laboratory. Continuing that history of purposeful innovation, the RenataDX Screening System is designed to ensure ease of use in clinical situations where system performance is critical to accurate analysis of biological samples,” said Andy Qiu, General Manager, Global Clinical Diagnostics Business at Waters. The need for dried blood spot analysis in clinical laboratories is growing annually. Scientists require more sample throughput capabilities to meet this demand. The bench-top system builds on the robustness and reliability that scientists have come to expect from Waters, allowing them to have the highest level of confidence in their results. The RenataDX Screening System also offers the flexibility laboratories require to adjust to their needs. With the ability to run any suitable FIA-MS/MS laboratory developed test or ready to use reagent kit, scientists are not locked in to a prescriptive workflow. 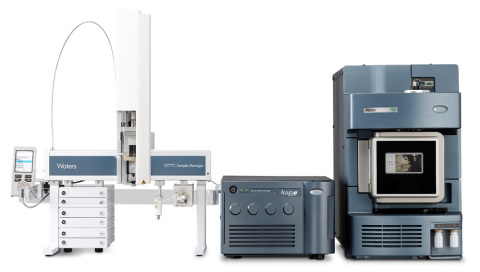 It incorporates the high-performance combination of the Xevo™ TQD IVD Mass Spectrometer, the ACQUITY™ UPLC™ I-Class IVD Binary Solvent Manager, and the 3777C IVD Sample Manager. Driven by the combination of MassLynx (IVD) and IonLynx™ Application Manager Software, data is streamlined and seamlessly integrated into laboratory workflows, allowing scientists to get their data in real time. The IonLynx Application Manager leverages Waters’ twenty years of experience processing FIA-MS/MS data, to present clinical scientists with a familiar, yet robust and reliable diagnostically-proven informatics tool. The RenataDX Screening System is manufactured as an U.S. FDA Class I medical device and is CE Marked to the European Directive 98/79/EC (IVDD).